Andrew Johnson – Do you know where he was in September 1866? Here is a history mystery for my readers. 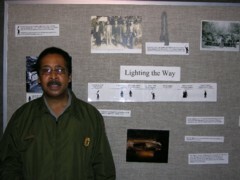 My friend, Edward Frank, is working on a documentary film about the Black Guides of Mammoth Cave. In his research he came across a reference that Andrew Johnson had visited the cave during one of his campaign swings. However, he cannot find any confirmation. Any one care to jump in and help sort this out?